I have just booked a bus trip to Falls from Mt Beauty. I'll be there for five nights and the total fare is $58 including entry. Go figure. I have to pay $5? to park the car at Mt Beauty but it's still a lot cheaper than LM! We recently took the kids up to LM over the school holidays. Sensational conditions. 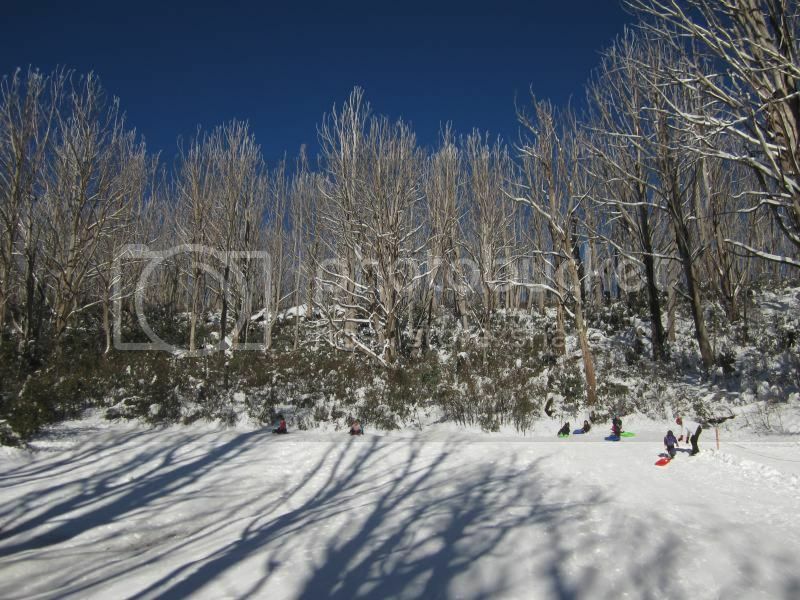 We've always lived in Melb but have only been to the snow once before (LM 5 years ago). I'd like to go up more regularly (including by myself for a bit of snowshoeing) but at $53 a pop its not gonna happen. That's just a bit too much. Its OK for a once a year trip with the family but not if you would like to go up several times each season. There definitely should be a tiered rate structure (eg less for a single person, weekday, non-school holidays, multiple visits etc etc). Weerab, when are you at Falls? I've booked for Hoppet week (17-24 Aug) so hoping to work on some skills at LM in the interim. Hi CC, I didn't know the Hoppet was on that week, just as well I am leaving Friday the 22nd. I have booked into Feathertop Lodge from the 17th, also booked Falls Coaches so don't have to worry about parking etc. Only booked a couple of days back as having a few issues with knee and hip ( getting old). I will be touring and maybe some easy downhill, certainly no skating. Where are you staying? I have taken two weeks hols so might go to Stirling the week after. Should be retired by now, but can't drag myself away! @teckel Ski patrol do walk up the summit trail. But the toboggan slopes, ski trails and a manned dispatch centre are frequented more, in accordance with greater visitor numbers in those areas. Making sure the toboggan users are in the correct area, and not using a banned toboggan is something that ski patrol and LM employees spend alot of time doing. Not aware of any such closure Greg. Yes, there was snow on the Spur, but it was passable at all times as far as I am aware. People called in all day and evening coming from that direction. Great news for weekday skiers - reduced entry fees. Got up for a ski today. Snow was good but slow and the grooming that would have been done earlier in the night had a fair cover of fresh over it so made a couple of the trails even slower. Absolutely magical scenery on the drive up with it snowing in Marysville and settling not to far beyond but it was a bit crazy with cars. The staff had a bit of trouble dealing with all the chain fitting which I guess they aren't all that used too. Got questioned and threatened with fines twice by people who didn't believe that my Subaru with AWD written on the back was actually an AWD. Road was clear of all snow on the way down and I reckon the next 3 days will be the pick of the season with some good cold temps firming the snow up and beautiful sunny weather. Firstly, great news about the fantastic price reductions midweek @teckel. Hi @tsangpo, what model Subaru were you driving? I went up a few weeks back in a Forester and they let me through although they were fitting chains to 2WD. I was a bit worried as it was snowing quite heavily but I was the last car in a convoy of 4 or 5 and the snow was being compacted quite well so I was virtually driving on a very thin later of snow. The Toyota Landy in front of me did lose the back end at one stage so it was pretty slippery! Liberty, so I can understand the initial misunderstanding but asking me are you sure and then saying if I'm lying I'll get fined is something I haven't encountered at any other resort and really quite suprised me. I can only assume snowplay punters try and get away without having to fit chains regularly? The conditions they had would have had chains being fitted to all vehicles at Hotham and Baw Baw and probably Buller but Lake Mountain didn't have the gradient for me to ever feel like I needed them. Got questioned and threatened with fines twice by people who didn't believe that my Subaru with AWD written on the back was actually an AWD. Chains a bit of a shemozzle today. For the 4th time this year, the ski hires in Marysville ran out of chains, so people had to come back to Narbethong to hire them. Tobagganing at Lake Mountain today was excellent on a dry cover of fresh man-made snow on the main run, whilst it was fast, slick and dangerous on the Leadbeater run. We were out the door at 6:50 am and were on the hill at about 8:45 am and managed to grab the last spot in the top car park. There was still buckets of snow around, it was evident that Thursday/Friday's dump was fairly epic, as many of the tree ferns on the drive up still had about a foot of snow sitting on them. Customer service greeted me promptly as I was unpacking the kids. Snow quality was fantastic, still crunchy and dry underfoot which actually meant that the main tobagganing run was quite slow and you needed a decent push to get moving. We headed over to the Leadbeater to beat the crowds and see more of the mountain but the run was actually a bit too fast and slick. Very pretty though. #1 child riding switch in the tobaggan run...steeze! 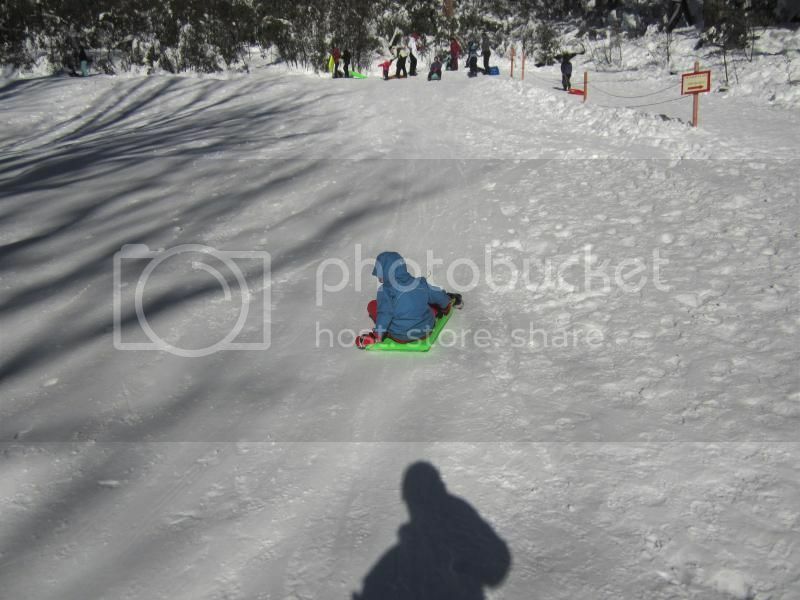 Was so slick at the top it took him about five minutes to actually sit in the sled without it running down the hill. Saw a young kid cut his lip within a few minutes so we decided to head back to the main run. Tried to build a snow man on the way but the snow was so dry and soft that it wouldn't compact at all. Shin-deep fresh all around. #1 child's two-year old Sympatex boots had given up the ghost so we had to stop to swap socks/shoes and wrap his feet in a blanket in the back of the car. That cheered him up a bit so we did a few more laps of the main toboggan run and headed home at midday. Was talking to the parking attendant, apparently the car parks were full by 10:30 am and they had implemented traffic controls in Marysville. Driving back down we saw big queues in the car parks waiting for the shuttle buses. Would have a been a crazy afternoon and we are glad to have got in early and got home. First time in years I've been to Lake Mountain. Am considering doing some XC next time. Only a two-hour drive sure is a bonus. Had lunch in Marysville at the patisserie. Fantastic Vanilla Slices and Guinness Pies with beautiful pastry. Highly recommended. cin, Majikthise, Claude Cat and 2 others like this. Marysville ski hire shops were absolutely chaotic. Most people patiently waiting in hour long queue but then people walking in at the end of the queue being served first. After an hour, most were told that they had no more chains for their 'standard' sized wheels and the advice was to go back home and try again next week or wait until mid afternoon until cars returned from the mountain to return chains, noting gates close at 5pm. Strangely, another option was to buy chains, as they were available for purchase. I thought they would be geared up better than that in peak ski season. Next time, hire at Narbethong. We kept supplying chains for most of the morning, and only ran out of a couple of sizes just minutes before the gates to the mountain closed. Wait time was about 15 mins when the coaches pulled in, less when they weren't there. Yep the key to a weekend visit to Lake Mountain is to go as early as you can. Getting in to the top car park makes the day much easier IMO. We did the craziest thing. Went up late on Saturday and.... went up AGAIN on Sunday!! On Sunday we got there around 8.50am and ended up at the front row of the 2nd carpark. Perfect - at the end of the XC home trails. Sometimes going up late can work. We went up late on Sunday, got held up at the roundabout in Marysville for about 15 minutes, then drove to the top car park (after officious git tried to block me in a Landcruiser from driving into the right lane near the ticket box. When I explained the situation re: season pass he backed off.) Great skiing, almost no-one about, surface was groomed but packed after some racing, I think. Then headed up to Mansfield for a mini ski safari. Surely others have been up who could post a report? Oh, well, another superb afternoon at LM. Top carpark full of families with toboggans, but very few on the trails. A brief sprinkle as I arrived, and 2-3 cm. of fresh dry snow on well groomed trails (but no classic tracks set this week?) Rubicon camp had a few groups out, Alex primary were having fun and Frankston High were setting up camp near the ugly shelter at Helicopter Flat. A cold night up there, I predict. Working on skate technique and fitness (both wanting) I made it out to Panorama lookout for a light lunch. The Bluff was looking good to the North. 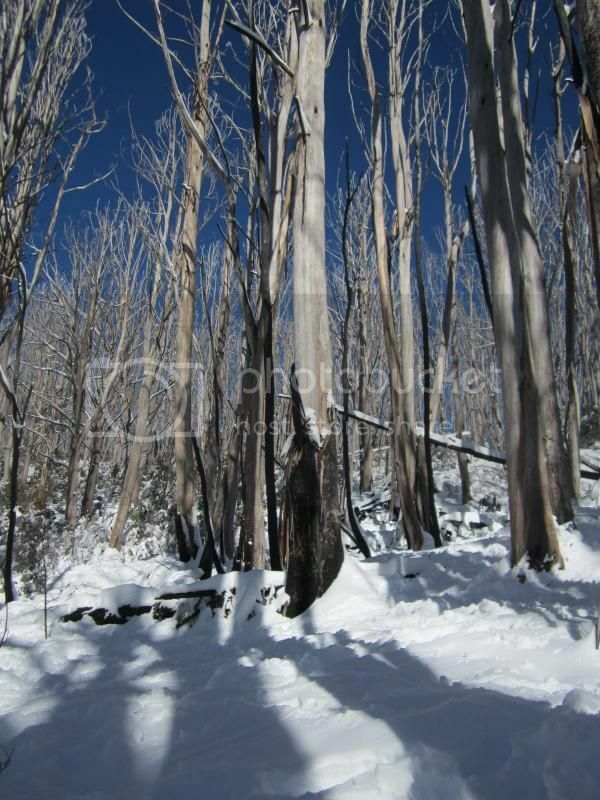 Check out Boudoir's report on skiing there in backcountry forum. Back to the carpark via Upper Muster, Echo Flat and Snowgum trails saw softening snow and some thin, brown patches appearing down low. Get up there before it rains, folks. Thanks to the ski hire proprietor at Narbethong (on the left, in the town) who commissioned me to test 2 pairs of classic skis. Great service and advice. I'll be back. Lake Mountain confirmed to us today that their snowmaking will end this Sunday (31 Aug). We think that means the mountain will close down for the season at the same time, but we'll get that confirmed tomorrow. It's a shame things won't be kicking on into September but all good things come to a end, and this season has certainly been good. Fantastic, in fact. Please note the above comment made by CCSH is preemptive. Lake Mountain Alpine Resort is currently considering an appropriate season end date based on available snow and projected weather conditions. It is anticipated a decision will be made shortly at which point all stakeholders will be notified. 1. A senior LMARM administrator told us that snowmaking will end this Sunday. 2. We thought the ski.com.au community would like to know, so later that day we posted a comment. Your comment suggests we were out of line, but our intention was simply to share information with ski.com.au users, which is what happened last year on page 5 of the 2013 LM trip reports pics and conditions thread when @carrotdude quoted LM's Facebook page because there was no word from the mountain on this website. If the information given to us by your office was off the record and/or embargoed then your senior staff member should have told us. If there's a new process in place for communicating start and end of season information (and any other mountain information) that we're not aware of then let's chat about it. We even began making plans to stocktake, reorganise staff rosters and so on, not that that's particularly relevant to you or anyone else reading this. We're not here to harm Lake Mountain's season or 'get the scoop'. Far from it. We're part of the Lake Mountain experience, we're stoked that the season's been a good one (for everybody), and we believe that the Marysville region's ski shops and the mountain need to work together to grow LM into a sustainable alpine destination. One last thing, if you decide the mountain is staying open beyond this weekend then we'll be just as happy as everyone else! I would like to congratulate Lake Mountain skiers on their excellent performances at the Kangaroo Hoppet on the weekend. So many of our local skiers (both mountain staff and other locals) skied with distinction. Particular mention should be made of Andrew Hall, Alan Eason and Andrew Paul who all finished in the top 50, even though none of them are exactly 'young' any more. Also Greg Paul and Robin Rishworth. And of course, Mary Hall - 15th in the women's category. In the Birky, Katerina Paul came 2nd in the women, 10th overall! Also in the Birky, Mike Wasley. TeleXC and ladycamper like this. Had a good experience at both Mystic Mountain ski hire and the resort this year. The one thing the resort needs is a roving resort consierge type role, someone stationed at the top of the two main toboggan runs. Tobogganing is very dangerous, especially as so many parents know nothing about the snow and how it works when you push your 4 year old down a slope into a crowd of other kids and worse grown adults who cant steer and weigh 12 stone. Imo, Lake Mountain would be crazy to prematurely declare end of season, particularly when there's a reasonable chance of snow on at least a couple of days early next week. Resort management has announced that snow-making will continue (and the season will keep going) at least until Sunday September 7th, when the situation will again be assessed. A heads up for tomorrow (Sunday 31st August). There will be no tobogganing tomorrow, due to snow-making being unable to keep up with the snow melt. The mountain will be still be open for snowplay, though and the tube run and flying fox. Let's hope the snow that the Bureau of Meterology is predicting for next week resolves the issue for next weekend. An update on this: the mountain is permitting tobogganing. They have advised the off mountain ski hires not to hire out toboggans, as the mountain will be handing out free toboggans for at least a couple of hours. I wish we'd known this earlier, as a couple of families have already gone back to Melbourne believing that there was to be no tobogganing today, as per the advice from the mountain yesterday. Just remember "It ain't over till the fat lady sings", and she hasn't sung yet. Next week could bring some nice snow. We're looking, at this stage, around the 11th to 13th September. Nothing is certain with the weather a week out, but at this stage, it's looking very hopeful. I wish we'd known this earlier, as a couple of families have already gone back to Melbourne believing that there was to be no tobogganing today, as per the advice from the mountain yesterday. This might be a beginner question, but why does the video say (after "just kidding") "Light skiing on the upper trails". Yet the statement elsewhere on this site is that all the trails are "closed"? I'm a bit confused by the lack of professionalism from the Lake Mountain videos, especially given yesterday's video. Can we please avoid making jokes because some people (including myself) will be easily misled. Tudor, I understand your confusion. The real state of affairs is that unless they get a significant snow fall within the next day or 2 (which looks more and more unlikely), the season is over. But what a great season it's been. Thanks to the mountain, the snow gods, and all the people who came up during the winter. Yeah, best snow I've skied this year was at LM, it was snowing off and on during the day. As luck would have it, it has snowed overnight, just 3 days after the resort has closed. I can't report yet, on how much snow has fallen. The good news is that entry to the resort is free. The bad news is that the snow will be soft and ungroomed. If you wish to hire gear, the mountain ski hire is closed, but we're open in Narbethong, as we are year-round, whenever there is snow on the ground. So stop on the left side of the Maroondah Hwy 1 km before the turnoff to Marysville & Lake Mountain. Is that a fair appraisal of the season teckel ? What is the next step for the mountain do u think ? Numbers on the mountain were the best for 10 years. I don't know. As a start, they need more toboggan runs and snow play areas. And a day shelter where people can escape the weather. (I still think it's a real shame they destroyed the old one over 10 years ago.) Even in poorer seasons, the current facilities are overstretched. They also need to be connected to the power grid. It's really up to Belgravia I suppose. But then they need a long-term lease (eg: 10 years) from the government, not the one year leases they've had so far, because the minister has sat on signing off until the season is about to start. Trail Head just up from the car park today (18/09/2014) about 4 cm depth there. 8-10cm further up the mountain. Looks very purty, is it skiable? trail coverage was continuous but not packed. Up higher the trails looked in good nick. Don't think it will hold out long though! Nice photos Brushtail. Thanks for posting. I saw the one in the weather section first, looks so good!